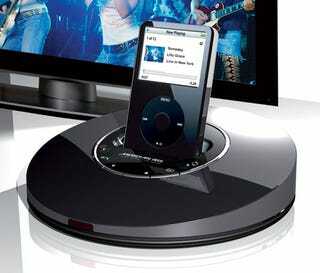 Users can play iPod videos on the big screen, with big-screen quality, clarity, and freedom from video-noise, "jaggies," or blocking-artifacts. I will believe it when I see it, or I guess when I don't see it. The system can handle 1080p through an HDMI connection, and 720p or 1080i through the component analog connection. Speaking of connectors, that little dock has a boatload of them: HDMI, component, and standard-def S-Video and composite video outputs, plus coax and optical digital-audio, and headphone and line-level analog-audio outputs. It even has HDMI input for a pass-through, so you don't lose an HDMI jack on your TV or receiver, and a USB jack for iPod syncing to a computer. And of course iRIS comes with a wireless remote control, in addition to control buttons on its face for source selection, iPod syncing, and shifting video format and aspect ratio to fit the screen. Cambridgeshire, England, September 5, 2007—Meridian Audio, the British firm credited with creating digital home theater, will introduce and demonstrate a unique new enabler for the Apple Computer's hugely popular iPod™ family of personal media devices at the 2007 CEDIA Expo. Like many other iPod "docks," the Meridian iRIS ™ Universal Dock for iPod accepts the full range of current iPod models and delivers battery charging and home audio-system integration and control. Additionally, the Meridian design features high-end video up-conversion processing (up to 1080p) that produces astonishing images with clarity and detail, delivering true big-screen performance from iPod Video. The Meridian iRIS design incorporates uniquely sophisticated and specialized video processing courtesy of its Qdeo™ digital processing engine from chip-maker Marvell®. This empowers the Meridian iRIS to derive upscaled and upconverted video—including full-HD-format 1080-progressive mode—with unprecedented quality. Instead of the lower definition resolutions "native" to small-format iPod Video clips, downloaded video can be displayed on the large screen in impressively tight, HD-formatted full-screen video—up to 1080p on HDMI, or 1080i or 720p via the Meridian iRIS analog component-video outputs. Qdeo technology further incorporates advanced DSP for per-pixel, motion-adaptive video processing that corrects both color and contrast losses. Simply put: Users can play iPod videos on the big screen, with big-screen quality, clarity, and freedom from video-noise, "jaggies," or blocking-artifacts—a first for any iPod Video-integrating solution. "It's not big news that the iPod continues to influence every aspect of home entertainment," says Meridian co-founder and Chairman Bob Stuart. "But the video side of the ubiquitous portable's capabilities has eluded effective usefulness in any sort of high-performance environment—until now. With the Meridian iRIS, Meridian can offer astonishingly good big-screen playback on today's HD displays, from an affordable device that features simple, 'dock-and-hit-play' usability." The Meridian iRIS circular design provides a standard Apple 30-pin dock connector on its top surface, accepting any current or recent "3G" iPod or iPod Video model, while its rear edge includes HDMI, component, and standard-def S-Video and composite video outputs, plus coax and optical digital-audio, and headphone and line-level analog-audio outputs. There's also an HDMI input to accept an outboard non-iPod source such as a DVD player or game-console, and a simple source-select button to switch between a docked iPod and an external source—so the iRIS needn't "use up" an HDMI input on the home system. Another simple iRIS button selects video format/aspect-ratio, matching the displayed clip to the home screen. A third automatically synchronizes the iPod with a computer linked via USB. Volume up/down keys complete the very simple and entirely intuitive iRIS controls. However, the Meridian solution also supplies a compact wireless remote controller that commands the docked iPod as well as the Meridian iRIS itself, and since Meridian iRIS displays iPod menus on-screen in the same format and organization as on the portable itself, there's no new interface to learn. Meridian's iRIS Universal Dock for iPod is available November, at a manufacturer's suggest price of $379. Meridian Audio Limited is based in Huntingdon, near Cambridge, UK, and was founded in 1977 by Allen Boothroyd and Robert Stuart. With a 30-year history of innovation and development of the highest quality consumer audio systems, the award-winning company is widely recognized as a world leader in digital and analog audio reproduction. Meridian developed the world's first audiophile CD player, the world's first consumer digital surround controller, developed the MLP lossless packing systems mandated for use in DVD-Audio and included in emerging high-definition disc formats, and is the only UK audio hardware manufacturer to be a member of the DVD Forum. The company's optical disc players, DSP-based loudspeakers and Digital Theater systems are unique in the industry, maintaining a super-quality digital audio signal throughout the path from the source to the amplifier, and using digital signal processing to generate advanced crossover characteristics that would be impossible with conventional passive analog systems. Meridian is also the exclusive manufacturer and distributor of Faroudja High-Definition video processors and projectors.